Our Blessed Mother was no longer standing before the foot of the Cross, gazing at her Son. Instead, Jesus’ body was laid in her arms and she held Him close to her Immaculate Heart. Though this was a moment of profound sorrow at the death of Jesus, it was also a moment of profound intimacy. As our Blessed Mother held the body of her Son, she knew it was not the end. Though her heart was pierced deeply, she knew that her pain would turn into joy. She was relieved that His earthly suffering was over, but her relief began to turn into hope and anticipation as she pondered His death and future Resurrection. As our Blessed Mother held her Son close, she would have reflected upon Jesus’ words spoken so often in His public ministry: “The Son of Man is to be handed over to men, and they will kill him, and he will be raised on the third day” (Matthew 17:22-23). She was witnessing His words come true. She knew that just as His prophecy regarding His death came true, so also His prophecy regarding His Resurrection would come true. “On the third day,” He said. Our Blessed Mother knew that her pain would soon be turned into joy as she began her vigil in anticipation of her Son’s Resurrection. In most of our lives, we will face events that tempt us to despair. These events may be small encounters in our relationships with others that leave us feeling hopeless, discouraged and disappointed. At other times, we may encounter grave and tragic events that seem to leave us in utter desperation. 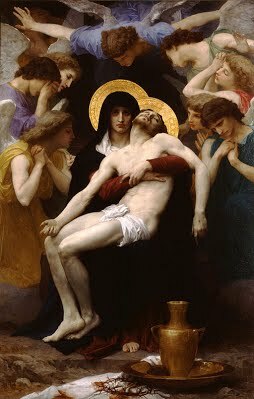 The meaning of the Pieta, our Blessed Mother cradling the dead body of her Son, can never be exhausted. It’s an image of hope in the midst of seeming hopelessness. It’s an image of love that conquers all fear. It’s an image of faith in the perfect plan of God no matter what comes. Reflect, today, upon this tender image of our Blessed Mother with the sacred body of her divine Son resting in her lap. Reflect upon her pain and sorrow. Ponder also her faith in the promise of her Son, her hope in the fulfillment of that promise, and her love which enabled her to press on through her own grief. There is much we can learn from our Blessed Mother. Her heart, in particular, was one that shone brightly with the perfection of every virtue. She is a pillar of grace and strength surrounded by suffering. She is an example for all. My dearest Mother, I can only try to imagine the sorrow you felt as you held your Son close to your Immaculate Heart. But I know that your sorrow was also mixed with hope as you anticipated the fulfillment of His promise. In faith, you knew this grief was not the end. My loving Mother, strengthen my hope in the transformation of all sin and suffering in my life. As I encounter the hardships of life, pray for me that I may never despair. May I follow your example of faith, hope and love always. Please hold me close to your Immaculate Heart and pray that I may share in the Resurrection of your divine Son. My dear Jesus, all earthly wisdom could not understand the meaning of Your suffering and death. By Your complete annihilation, You conquered the ruler of this world and destroyed his power over my life. May I see in this image of Your dead body a promise of Your Resurrection. As I encounter struggles in life, give me hope and trust that final victory is always found in You.